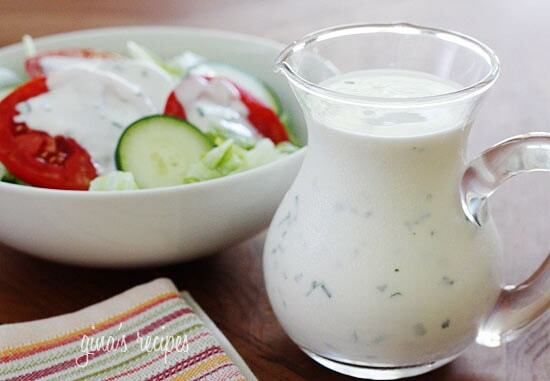 A creamy low-fat ranch dressing made with buttermilk and fresh herbs. 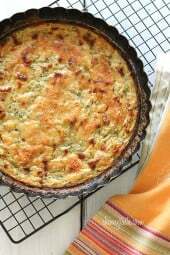 Perfect to serve with end-of-summer garden vegetables! There is nothing better than homemade dressing, store bought dressing just doesn’t do it for me. 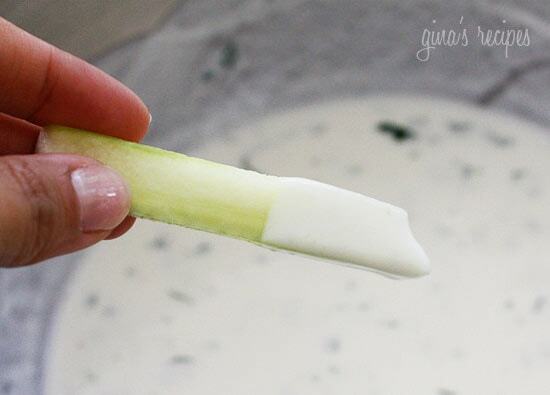 Serve this over your favorite garden salad or dip your favorite veggies in it. I slightly modified this recipe from my friend Susan’s blog Farmgirl Fare. I love her blog, she is a former California city chick turned Missouri farm girl, complete with chickens, sheep and donkeys! I often tell her how lucky she is to have her own farm fresh eggs and fresh produce, and she often tells me how lucky I am to live near a Trader Joe’s. 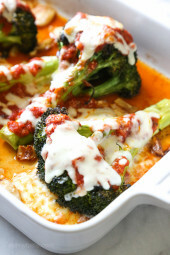 You can easily halve this recipe and leftovers can be stored in the fridge for about 4-5 day. Enjoy!! 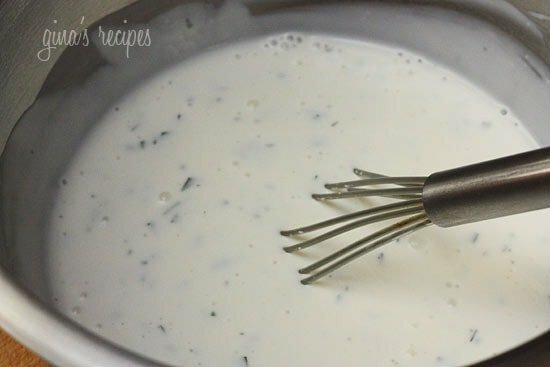 In a small bowl or large measuring cup, combine the sour cream, yogurt, mayonnaise, garlic, powder, onion powder, parsley, chives, salt, and cracked pepper. Mix well. Adjust the seasonings to taste, adding another tablespoon of balsamic vinegar if desired. The flavors will become bolder over time. Could you substitute the mayo for something else in the recipe? Never did I ever think I would or could make my own salad dressing besides a simple dressing of oil and vinegar. 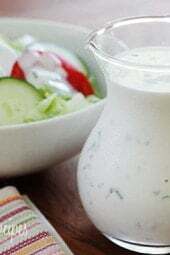 But now that I have made this recipe and Gina’s recipe for blue cheese dressing I am hooked on homemade!There are so many additives to bottled and packaged dressing. Not to mention unhealthy levels of sugar and sodium.The ingredients for this are fresh and wholesome. The taste is to die for. I am hooked and my family is very impressed. Thank you Gina!I just preordered Gina’s new book and can’t wait to see what other cooking ideas she will awaken our tastebuds with. I never thought about using on a sandwich. Great tip! Love this salad dressing but it makes more than I can use in 4-5 days. Do you have any tips for cutting the recipe in half? Just halve everything. That’s what I do. I always have a jar of this in my fridge. Excellent as a dressing, to dip veggies or to put on a sandwich. Thank you for such a fresh and delicious recipe! This was amazing! Like many said, I just can’t do light mayo so I used half as much of regular. I have been doing your lowfat/low cal blue cheese for over a year and as much as both I and my husband love it, I was looking for a change. This did not disappoint! Thank you so much! Oh my gosh – soooo good! Based on the ingredients, I wasn’t sure I was going to like it (I hate light mayo, and basically all fat-free dairy), but I LOVE this recipe. I’m going to grill up some chicken and use it as a little dipping sauce. It makes a lot, so I think I’m going to find lots of different ways to use this dressing throughout the week. It’s so good and versatile! Thank you so much for another winner! I don’t like low fat mayo either but I find that if you use the Hellman’ s low fat . 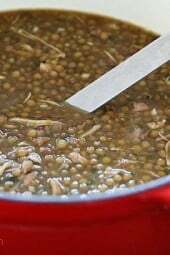 In recipes in combination with other ingredients it works fine. The one thing I have trouble compromising on is when it is the only ingredient, or in a turkey sandwich or BLT. I have combined the light and regular mayo there but that is as far as I will go for those two sandwiches! Gina, how long would this stay good in a mason jar in the fridge? I want to try it, but don’t want to waste leftovers. Thanks! I can’t find no fat sour cream what can I use instead? I love salad, but only if I can have a ton for creamy dressing on it! Hidden Valley Ranch, yes! Not so healthy. After making this dressing, I will never use Hidden Valley again!! Amazing clean flavor! Since the calories and fat are so low, I am now having salads twice day. This dressing is absolutely decadent! Thanks Gina!! What can be used in place of white balsamic vinegar, or where can this be found? Jeanette, I didn’t have white balsamic either so I used malt vinegar. Dressing is fantastic! I will look for white balsamic when shopping though.